How to watch 22 July (2018) on Netflix Netherlands! 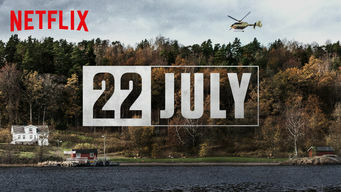 Yes, 22 July is now available on Dutch Netflix. It arrived for online streaming on October 10, 2018. We'll keep checking Netflix Netherlands for 22 July, and this page will be updated with any changes. After devastating terror attacks in Norway, a young survivor, grieving families and the country rally for justice and healing. Based on a true story. Families, shattered. A nation, stunned. A story of grief, strength and resilience in the face of hate. Based on real events.